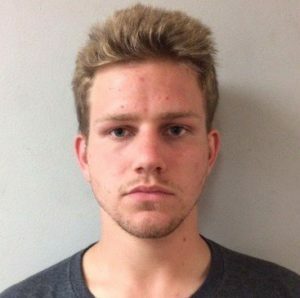 An Arroyo Grande teen is in jail after he allegedly stabbed a man in a Grover Beach parking lot on Sunday, then fled the scene on the victim’s bike, according to the Grover Beach Police Department. At 11:26 p.m., officers responding to a report of a stabbing at the Vons parking lot found a 21-year-old man who had been slashed once across the face, Responders transported the victim, who suffered moderate injuries, to the hospital. Before officers arrived, Elijah Jeremiah Hill, 19, snatched the victims backpack and fled on the victim’s mountain bike. Overnight, officers searched for Hill in locations where he had previously stayed. The officers did not find him. But, at about 10 a.m. on Monday, Hill contacted Grover Beach police and agreed to turn himself in. Officers took Hill into custody and booked him in San Luis Obispo County Jail on charges of assault with a deadly weapon and felony theft. Hill remains in jail with his bail set at $25,000. Investigators request that anyone who has further information about the incident contact the police department at 473-4511. Keep your eyes open when you’re out and about. We live in paradise so we can at times let our guard down. More than ever we need to stay alert to our surroundings and the good people of our fine area need to have each others back. The government both federal and state are releasing criminals early. Ridiculous pardons and ridiculously short sentences have placed all of us at risk. Law and order leadership is long over due. Drop this sociopath into the prison system and find ways for him to never get out.